The serene shade of indigo has been used across the world for over 6,000 years. Indigo dye is among the oldest to be used for dying textiles and making prints, and was first documented in history as being used in Huaca Prieta, Peru. Since its discovery, indigo dye has been used in the ancient civilizations of Japan, India and Southeast Asian countries, Mesopotamia, Egypt, Iran, and Africa. When Sir Isaac Newton began his research on the continuum of colors, he introduced indigo as one of the seven basic colors that could be shown through a prism creating the optic spectrum. When indigo dye made its way to the ancient Greeks and Romans, it was long valued as luxury product. Arab merchants brought indigo dye from India during the Greco-Roman era, and thus the latinized word indigo, derived from India, was born. In Mesopotamia,a neo-Babylonian cuneiform tablet of the seventh century BC gives a recipe for a lapis-like color being used to dye wools, pigments for paintings, and cosmetic purposes. The early Spanish colonists setup indigo dye production in Guatemala, and has been a key element in the color palette in the country since. The color indigo is named after the indigo dye derived from the plant Indigofera tinctoria and related species, although a large percentage of indigo dye produced today is synthetic. The color is primarily used to dye cotton yarn or silk; about 20 thousand tons are produced annually, primarily for blue jeans. Indigofera tinctoria, also called true indigo, has been naturalized to be cultivated in tropical areas of Asia, Africa, and the Americas. Since it is a legume, it is also widely used as a soil-improving ground cover, and is rotated into fields similarly to alfalfa and other beans. Dye is obtained through processing the leaves through fermentation. When indigo was introduced into colonial South Carolina, it became the second-most important cash crop after rice. 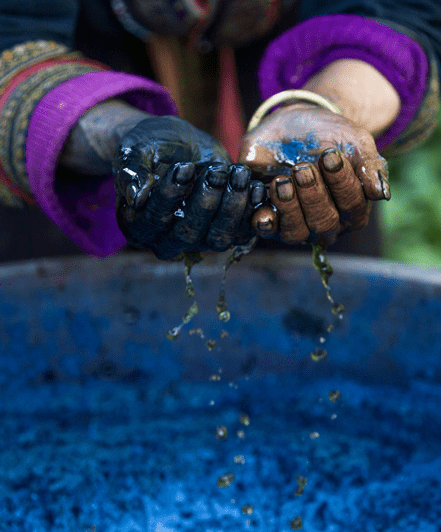 Because of its high value as a trading commodity, indigo was often referred to as blue gold. Its common use is in creating the popular Shibori and tie dye fabrics in both cotton and silk, as well as denim. Eventually, the demand for indigo outweighed the capacity of supply, and a synthetic alternative was developed. In 1883, a German chemist first synthesized indigo, and by 1897, his formula was made into a commercially feasible manufacturing process for mass-production. Look at these beautiful Bunglo modern pillows in indigo shades! Stay tuned for the origins and processes of other dyes and textiles!